And that's just what they could fit on the poster! "I love the West. I read a lot about the West, and I'm shocked, I'm ashamed that in pictures they have not made the true story of the winning of the West—comprising 90 percent foreigners, 100 percent laborers, nothing to do with guns. Streets, mountains, roads, bridges, streams, forests—that's the winning of the West to me. Hard! Tremendous, tremendous fight. But [instead] we have, as you know, cowboys and Indians and all that." — Samuel Fuller, director of three film Westerns. The American Old West was the land west of the Mississippi River roughly in or around the latter half of the nineteenth century; specifically we might start what we now think of as the "Wild West" era with the California Gold Rush of 1848 and end it with the U.S. Census Bureau's official recognition in 1890 of the end of the frontier. This setting is home to The Western, a definitively American genre almost as stylized and standardized as Commedia dell'Arte. The Wild West is basically the Theme Park Version or fictionalization of this setting. It has its own set of specialized subtropes, including a wide assortment of stock character types and its own specialized locations. The Theme Park Version of the Old West is a land of Indians, grizzled prospectors, scenic bluffs, Conestoga wagons, tough, shotgun-toting pioneers and buxom, be-feathered dance-hall girls. Also home to very lucrative sugar glass and balsa-wood chair industries, judging by the number of bar brawls which occur during a single episode of a typical western series. Bad guys and anti-heroes wear black hats, good guys and sheriffs wear white hats, shootouts on Main Street occur with the frequency of at least one an hour—with the sun at high noon each time—and everyone drinks sarsaparilla or whiskey. The real Old West was nothing like The Theme Park Version (which was originally the creation of 19th-century "dime novels"). There weren't any huge shootouts, quickdraw duels were rare, and gun duels and violent gun-wielding criminals weren't exclusive to desert-like "western" areas. Plus, since many guns were very inaccurate in those days, they sometimes tended to happen in significantly closer quarters than they do in fiction. The average Western town had 1.5 murders per year, and most of those weren't done with guns (due to the West having a relatively small population compared to the East). Carrying guns in these towns was more likely to get you arrested than shot, and you were much more likely to die from diseases like cholera, dysentery, and tuberculosis, or in an accident like being dragged by your own horse, than to be killed in a raging gunfight or get scalped by Indians. Although, by all means, it was still a lawless and violent era, with three major 19th-century American wars taking place in the frontier (the Mexican-American War, the American Civil War and the American Indian Wars) and also other range wars, bandit attacks and feuds. Not to mention that courts were almost non-existent, so settlers substituted with vigilance committees, which were more focused on lynching people than doing any law practices. But overall, the Wild West was not so wild — it was actually more simple and boring, in fact. See also The Western (the genre of works which largely take place in this setting). A popular subject of The Parody, and surprisingly popular outside America. Frequently overlaps with The Savage South. Dawn of the Wild West is a sub-trope set during the time period just before the Wild West. Twilight of the Old West is about the dying embers of the Wild West flickering out during the early years of the New Old West. May overlap with Settling the Frontier. Largely occurs contemporaneously with The Gilded Age. Adventure Towns: Many towns were depicted as havens of debauchery. Anti-Hero: ...would draw before the villain. Badass Bandolier: Especially during the Mexican Revolution. Badass Longcoat: One could argue this fashion arose from the long duster coats which were commonly worn in this period, and which mythical cowboys — and cool guys in general — have been wearing ever since. Bandit Clan: The Dalton gang and Jesse James had family members in them. Black and Gray Morality: The villains are usually ruthless, greedy and despicable characters. On the other hand the "heroes" are not exactly noble guys either. See Anti-Hero above. Blasting It Out of Their Hands: Usually only when an unrealistically pure good guy is shooting. Boom Town: The gold rush created many towns raised in places where people presumably could find gold. Bounty Hunter: With so many outlaws being around some people made it a profession to track them down in order to get the reward for their capture. Card Sharp: Some people were very good with cards, almost too good at times. If you were lucky you were just tarred and feathered for cheating. California Doubling: The geography of the American West is varied, but most movies tend to take place in Monument Valley. Spaghetti Westerns often used the Tabernas Desert in Andalusia, Spain to double for America. Cool Guns: The Colt M1873 and Winchester lever action rifle have acquired legendary status to present day. Cool Train: So cool that if you find railroad clipart or caricatures, chances are, it's designed around the kind of trains used in the American West. Country Music: The genre originated here. Cowboy Episode: When The Wild West seeps into a series that isn't The Western. Crapsack World: Rampant lawlessness. Constant war with Indians. Everyone carries guns. Very little opportunities for a bath. Why did anyone ever romanticize this period? Feuding Families: The HatfieldMcCoy feud is the most famous example of two families fighting one another to the death. Interestingly enough, their descendants have reconciled and strongly distanced themselves from their violent predecessors. Still, all stories set in the Wild West that depict a rivalry between two families will be based on them. Friendly Local Chinatown: This time period was when Chinese people were starting to immigrate to the US, forming the first ever Chinatowns. Expect to see a Chinese Launderer. Gambling Brawl: Cowboys like to bring guns to a poker game. Gatling Good: For superior firepower in any gunfight. Ghost Town: Whenever a place was no longer economically profitable it would soon die out. Guns Akimbo: A Justified Trope—with the single-action revolvers of the period, it was quicker to fire one gun, then fire the second while you were cocking the first. It was just as inaccurate as it is today, though. The Gunfighter Wannabe: Characters will frequently try to be a tough and quick sharp shooter, but be the laughing stock of the actual gun experts. Hanging Judge: Roy Bean is a historical example, though his legend has been exaggerated. Historical-Domain Character: Wyatt Earp, Doc Holliday, Billy the Kid, Calamity Jane, Frank & Jesse James, Wild Bill Hickok, Geronimo, Roy Bean, Buffalo Bill, among many others. Humans Are White: Although historically about a third of all cowboys were black or Hispanic (And the word "cowboy" itself originally referred specifically to black farmhands), it wasn't until the 1960s that any black people started showing up in Westerns, and not until the 1970s that they started being main cast members. Kirk's Rock: Frequently used in Westerns due to its convenience to Hollywood. Knight Errant: The "wandering gunslinger" variation. Mobile Kiosk: Most of the alleged doctors in the Wild West would travel by wagon from town to town selling a 'miracle elixir' said to cure whatever ailment they could come up with. These show up in Westerns from time to time. Outlaw: Many criminals are wanted "dead or alive". Price on Their Head: Someone is willing to pay for this character, dead or alive. Quick Draw: A trope that shows up in the Showdown at High Noon. For every time someone says Crazy Horse's father was white, even though he inherited his name from his father. In general, most depictions of classic cowboys in media show them as disproportionately white. While there obviously were white cowboys, there was also a much higher percentage of black, Asian, Latin, and Native American cowboys than is typically portrayed in the media. The Remnant: A number of outlaw bands are made up of ex-Confederate soldiers who just kept fighting the war even after it ended. Riding into the Sunset: The best way to end your western, so that the hero can go off to new adventures. Run for the Border: A typical tactic by many outlaws wanted in one state. The Savage South: Typically there is more lawlessness and danger in the southern areas than the northern ones. This is especially common in the unrest of the years following the Civil War. Sawed-Off Shotgun: Typical Western guns were always shorter and lighter compared to what a modern rifleman may use, since they were designed to be fired from horseback. Settling the Frontier: Settlers and new settlements play a major role in many Westerns. The Sheriff: Even though sheriffs have existed since the Middle Ages, most people automatically think of a sheriff as depicted in the cowboy era, with a big moustache and a star badge on his chest. Showdown at High Noon: Cowboys will settle matters at high noon in a duel. Smoking Barrel Blowout: Gunbarrels are more likely to smoke in the first place than in later eras with higher quality gunpowder. Snake Oil Salesman: There were a lot of cunning tricksters around in those days. Tar and Feathers: A common humiliating punishment for people who didn't obey the laws. Throwaway Guns: Revolvers are slow to reload, so a good gunfighter will have several to draw from as the previous go empty. Rare in Real Life, as modern guns and ammo during the 1870s were too expensive for most poor people on the frontier. Train Job: A setting with a lot of trains and a lot of criminals naturally leads to a lot of train robberies. "Wanted!" Poster: Expect to see them all over town, especially if the bad man featured on it is the Big Bad, one of his henchmen, or at least relevant to the plot. In some cases even the good guy might end up on one if he's been wrongly accused and needs to prove his innocence. The Western: The genre that takes place here. Western Characters: The full collection of stock characters of Westerns are listed on this page. Blueberry: Renowned comic book series about a badass cowboy. Drawn in a realistic style. Les Tuniques Bleues: Tragicomedic comic strip series about two soldiers that started in the Wild West and became increasingly set during the American Civil War. Justice Riders: An Elseworlds tale following the Justice League equivalent in the wild west on Earth-18. Diana Prince is a super-powered Sheriff in this world, and her traditional lasso fits in well with the aesthetic. Lucky Luke: One of the most popular cowboy comics in the world and a clever Satire of all the tropes of The Western. Marvel Comics had a number of Western heroes, including the Rawhide Kid, the Two-Gun Kid (who got unstuck in time and briefly became an Avenger) and the original Ghost Rider (who dressed up as a ghost, not the guy with the flaming skull). In the modern age, a miniseries called Blaze of Glory revived those characters to show their final days. Suske en Wiske: The stories "Bibbergoud", "De Texas Rakkers", "De Gouden Locomotief", "De Bevende Baobab",... all take place in the Wild West. Nero: "De Bende Van De Zwarte Kous", "Het Ei van October", "Het Groene Vuur",... all take place in the Wild West. The Lucky Luke animated features Daisy Town and La Ballade des Dalton. Disney's Home on the Range. See Index of Film Westerns for a more complete list. Blazing Saddles, an Affectionate Parody and gag comedy of the genre. The Life and Times of Judge Roy Bean is an interesting partial inversion—it actually is set from the 1890s to the early 1920s, yet plays the Western trope very straight. Bonus points for being actually based on a true story, showing that The Wild West was able to partially live on into the 20th century. McCabe & Mrs. Miller, which averts the typical old Hollywood version of the West. The Shootist, notable for being John Wayne's very last film. Also another Western that takes place after the romanticized age, right after the turn of the 20th century. Unforgiven, a revival/Reconstruction of the genre after Heaven's Gate killed it dead about 15 years before. Young Guns and Young Guns II. One of the downtime locations in Time Scout is Denver, 1885. A lot of people go down there for Wild West shooting competitions. The Alloy of Law has the Roughs, which are a Fantasy Counterpart Culture version of the Wild West. Many of the novels of J.T. Edson, including all of The Floating Outfit, Waco and Waxahachie Smith series. While he is now better known for fantasy, Robert E. Howard wrote many, many Western tales, both humorous and serious. Louis L'Amour wrote scores of western novels. Dime Novel inventor Frank Reade had quite a few adventures out West. Six-Gun Snow White is the original fairy tale re-imagined in this setting. Karl May's Winnetou novels set in the 1860s to the 1870s timeframe are the source of the stereotypical image of the West in European countries. The novella River of Teeth is set towards the end of the 19th century around the southern part of the Mississippi river and has gun-toting gunslingers, outlaws, gamblers and remote bars just waiting for a fight. That the entire area has become hippo country and the cowboys ride hippos only adds to the fun. An episode of Adam Ruins Everything addressed how the perception of the Old West in media is very different from the historical version. The First Doctor paid a visit in "The Gunfighters". And again, the Eleventh in "A Town Called Mercy". Firefly was The Western IN SPACE!. Highlander had quite a few Western flashbacks of Duncan's earlier history. The MacGyver (1985) dream episodes set in the town of Serenity. Ethan Chandler in Showtime's Gothic Horror series Penny Dreadful is the star of a traveling Wild West Show. A single episode of Star Trek: The Original Series ("Spectre of the Gun") put the main cast at the gunfight at the OK Corral. A Star Trek: The Next Generation episode saw Lt Worf and son in a holodeck simulation set in this era. In the Supernatural episode "Frontierland" (S06, Ep18), the Winchesters travel back in time and meet Samuel Colt. Wild West Tech: This show isn't so much set in this time and place as discusses this time and place. And the technology to be found there. The Beatles did a Wild West tale of failed revenge with "Rocky Raccoon", a song from The White Album written by Paul McCartney. The Bonzo Dog Band's "Bad Blood", from Let's Make Up and Be Friendly, is another Western revenge tale and an Affectionate Parody of Johnny Cash. Gangstagrass, the band who did the theme song for Justified, have many Western Boastful Rap songs, like "Quickdraw " and "Gunslinging Rambler "
Carrying me to my burying ground. The "Wild West" table of Psycho Pinball takes place in a Theme Park Version, complete with a bank, jail, rodeo, and nearby gold mine. Also played for laughs in Cactus Canyon. Maverick The Movie, based on the 1994 film. Dogs in the Vineyard, although its version of the time period is a lot less Wild, so to speak. Rifts New West adds a lot of magic, monsters, and cyberpunk flavor, and in-universe is a deliberate attempt to re-create the Wild West as a way of holding on to lost history. Naturally, they get some things wrong. The Girl of the Golden West, play by David Belasco and opera by Giacomo Puccini. 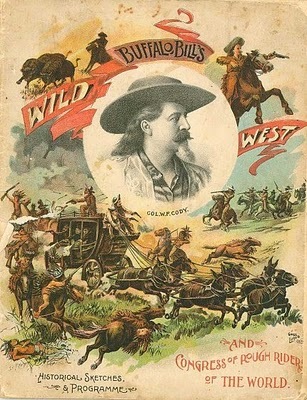 Buffalo Bill 's Wild West shows popularized cowboy stories near the end of the 19th and early 20th century. Frontierland in the Disneyland parks. The western sequence on The Great Movie Ride. In the Paris and Anaheim versions of It's a Small World, the United States is shown in its Old West days. The former show, The Wild Wild Wild West Stunt Show at the Universal Studios parks. Tweetsie Railroad in Boone, North Carolina is a mix between this trope and Cool Train. In The Adventures of Lomax, the third world is like this, complete with cowboy enemies. Stage 3 of the Animaniacs Licensed Game for the Sega Genesis takes place on the stage of a western movie. The first half of the level takes place in a western town, and the second half takes place on a train. Bastion evokes this with its old-timey narrator and most of the soundtrack, which is full of banjos and the occasional voiced song that sounds like a traditional folk song. In Chip 'n Dale Rescue Rangers 2, one of the levels takes place in the Western World section of Fat Cat's Amusement Park, where one of the three keys to Fat Cat's control room is hidden. The level has a few Minecart Madness elements, and the boss is a cat magician who tosses playing cards. Fallout: New Vegas takes place mainly in the Mojave, and outside of Vegas itself, mostly resides here. You can even take a perk named 'Cowboy' to make your .45-70 lever-action deadlier than a triple plasma rifle. Fistful of Frags is a multiplayer first-person shooter based on the Source Engine. Its most prominent feature is the effect that period weaponry has on a typical FPS death-match arena. The weapons are slow, clunky, but very powerful, placing a greater emphasis on landing your shots. In The Itchy and Scratchy Game, the fifth level, "The Magnificent Severed" takes place in the desert, with a western town in the background. Enemies include cowboy dogs and Scratchy robots dressed like Native Americans. The boss of the level is Scratchy in a chuck wagon. In Bugs Bunny: Rabbit Rampage, Level 2.1 takes place in a saloon, with such enemies as Red Hot Ryder, Hiawatha, and root beer vendors. The boss of the stage is Nasty Canasta. Taz in Escape from Mars has Mexico, which serves as the fourth world, and the first one that deviates from the game's Space Zone theme. The first act has Taz jumping across a cattle drive, and the boss of the world is Toro the Bull, whom Taz fights as a Bull Fight Boss. In Desert Demolition Starring Road Runner and Wile E. Coyote, the "Buttes and Ladders" level takes place in a western town. Level Two of Porky Pig's Haunted Holiday takes place in Dry Gulch Town. The boss of the stage is Yosemite Sam. A couple of Mount & Blade Game Mods, especially 1866: A Mount & Blade Western. Plants vs. Zombies 2: It's About Time: One of the time periods takes place in the wild west, featuring minecart rails that help the player move their plants around, as well as western-themed zombies—cowboys, prospectors, saloon pianists, rodeo bulls, and... chicken wranglers. Red Dead Redemption: While the game itself is set during 1909, it fits many of the tropes associated with the Wild West. The game even has three distinct acts, with the first being the Standard Western (good guys, bad guys, etc), the second taking the form of the Spaghetti Western (moral ambiguity), and the third and final act set in the Dying West. Red Dead Redemption II: A prequel to its predecessor set in 1899. It very much straddles the line between the Old West and the Twilight of the Old West. In Sesame Street Countdown, the sixth level takes place in a western town. Sly Cooper: Thieves in Time has the Cotton Mouth Bluff world, complete with coyote/jackalope/steer guards, a huge train moving through the world, a Small Name, Big Ego armadillo sheriff, sarsparilla bars, and the guncane-toting "Tennessee Kid" Cooper. The Caper of the world is even a train robbery. Crystal Egg Zone from the 8-bit version of Sonic the Hedgehog 2 is vaguely themed on this setting, with cacti, patterns in the terrain inspired by Native American artwork, and the familiar deep blue sky of the desert. The fourth board, Riot Train, has several Wild West elements. The enemy monsters are a gunman who shoots, a cowgirl who whips, and a horse and open wagon who charges at you, should you lose to any of them in battle. Also, the "Ring Lasso" mini-game that takes place on that board involves Sonic and his friends lassoing bags of rings and forcejewels from passing freight cars by pressing specific buttons. The mini-game even has a western Leitmotif as the background music. In the same game, there's also the "Sonic Gun Slinger" mini-game, which takes place at a saloon, and has the same western leitmotif as the background music. Sonic and his friends, who are all dressed in cowboy hats, must shoot the gunslinger targets, whilst avoiding shooting the lady targets. There's also an Eggman target, which takes more than one hit to kill and can shoot back. Rail Canyon Zone and Bullet Station Zone in Sonic Heroes are massive railroad networks within an extremely large canyon. As it was built and operated by Mad Scientist Dr. Eggman, it has a metallic, industrial look to it, but Eggman fully embraced the western setting in his decor and unusually (for him anyway) large amounts of wooden structures. The Rocky Ridge racetrack in Sonic Free Riders is set in a gold rush town in a mountainous area. It's at odds with the rest of the game, which adopts a futuristic theme. Rocky Ridge's start/finish line even has the word "WESTERN" painted on it in huge letters! Frontier Canyon Zone, the fifth Zone in Sonic Rivals 2, as its name suggests, is a Ghost Town in a canyon. Mirage Saloon Zone from Sonic Mania. Sonic and Tails' story has Act 1 start with Sonic and Tails riding the Tornado, which leads them to a train driven by Dr. Eggman; or, as Knuckles, exploring a canyon in the outskirts of the area. All three characters venture into the desert itself in Act 2, which is dotted here and there by saloons and other buildings. Stay Tooned! has the Wild West room, which has two mini-games you can play. In the "The Quick and the Tooned" mini-game, you play as Dr. Pickles, and you have to shoot gun-wielding enemies in a saloon whilst avoiding getting shot by them and avoiding shooting characters without guns. In the "Let's Shave Fiddle" mini-game, you can shave Fiddle in the barber shop and earn a door key in the process. Western Land in Mario Party 2, appropriately, embraces this setting for all it's worth. Sunset Wilds in Mario Kart: Super Circuit is set on the lands run by a Native American-esque group of Shy Guys. The Orange Sector of Prism Island in Paper Mario: Color Splash has a western motif and a train. The second level of Buster Busts Loose takes place in a western town, featuring The Coyote Kid (from the TV series episode, "High Toon") and his henchmen as enemies. Here, Montana Max is in the progress of robbing a safe, and the second half of the level takes place on a runaway train to chase after him. In Tiny Toon Adventures 2: Montana's Movie Madness for the Game Boy, the first stage takes place in a western movie. Enemies include Roderick Rat clones dressed like cowboys and buzzards. The boss of the stage is Montana Max dressed as a cowboy. In the Game Boy version of Wacky Sports, in Carnival Mode, Fifi La Fume's mini-game is a water-squirting challenge that takes place in a western town, where the player must hit as many Roderick Rat targets as they can, whilst avoiding Sweetie Bird, Concord Condor, and Little Beeper. In Acme All-Stars for the Sega Genesis, one of the five arenas is the Western, which takes place in Prairie Junction from the TV series episode, "High Toon". When playing basketball or soccer, the players must beware of barrels that sometimes roll onto the field and flatten them, and getting kicked by the horses in the field if they get too close to them. In the Toy Story 2 Licensed Game, the eleventh level, "Al's Penthouse", has shades of this. The level is filled with Woody's Roundup merchandise, and has a western Leitmotif as the background music. The mini-boss of the level is Gunslinger. Trouble in Terrorist Town: Technically if you go on the Mogz server hosted in the UK on the maps de_westwood and cs_desperados the modern guns have been replaced by western ones. However they do not have auto reload which means once your clip is dry (Shotgun 7 shells, Double Barrel 2 shells, Lever Rifle 5 bullets and 1 bullet for the sharps and six for either the colt or peacemaker) you have to pistol whip your opponent or get out of range and reload. The Wild ARMs series combines western tropes with a Standard Fantasy Setting. How Western the series is varies per game. Survival Of The Fittest: Virtua-SOTF, a Mini site game, has been confirmed to be a Virtual Reality game that takes place in a "Old West" setting. This is one of the eras visited in Chrono Hustle, especially seen in the third story. The Histeria!! episode "The Wild West"
Several Looney Tunes episodes, usually the ones starring Yosemite Sam. Examples include "Drip Along Daffy." My Little Pony: Friendship Is Magic has a Cowboy Episode where the girls visit Appleloosa; there you can find horse-drawn carriages (they switch), among other things. The Van Beuren Studios cartoon shorts "Hot Tamale", The Gay Gaucho", "In the Bag" and "Redskin Blues" are all set in this time period. "Borrowed Time", a melancholy short about a boy and his father who are traveling by wagon, only to be attacked by bandits.